Follow the visit of one of our trustees, Hirsh, to Nepal as he works to introduce our Quality Education Project to schools in Nepal. 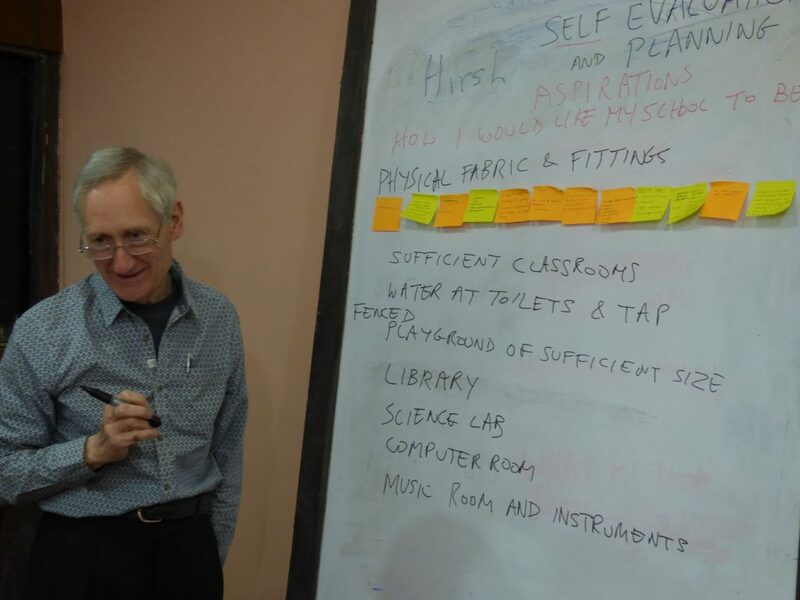 He also took some time to visit India to follow-up on work done last year on the India Quality Education Improvement Project by another of our trustees, Ruth. If you’ve missed it, catch up on Part 1 of his blog here! Since I arrived in Nepal last week I have visited lots of schools, 11 I think, and spoken to the Heads, or sometimes one of the senior teachers. I’d been focusing on warming them up regarding the workshop I had been planning to introduce the Education Improvement Project. And then to the workshop itself! Of course not all the schools could come – but 14 representatives was a great start, and I had plenty of willing listeners for this new concept. I did more or less the same as Ruth did in India – I used the majority of the day to build Headteachers’ aspirations for their schools together section by section. We used post-it notes to scribble down ideas, and to allow us to move them around in terms of priorities. As the post-its grew, I had the rather difficult task making sense of 14 sets of somewhat disparate views all expressed in the individualistic English of the participants! No surprises though as, once again, the session proved that group work always results in more perspectives and a richer outcome. Given the post earthquake environment, I decided it was wise to have a discrete section on fabric and facilities – we dealt with it first as it would otherwise have been the elephant in the room as that is a key concern and area where much improvement is still needed for most schools. I had Prakash, one of Jimmy’s staff, who looks after school quality improvement as part of his role on hand to help me collate notes. With a very quick turnaround time, he managed to run from the guesthouse in Melamchi where we were holding the workshop to a shop in the village to print an (almost legible!) version of the final points so that we could circulate copies to the participants before they headed home. While he was running around, I had a go at taking the Heads through trying out the self evaluation, evidence and next steps phases so they would at least understand what they should do (there was too little time for them to do a proper self assessment at the meeting but they had a shot at one of the five sections). Prakash and I graded the particpants afterwards according to what we felt was their grasp and commitment. There were a number of schools who were definitely enthusiastic, while everybody else at least achieved an understanding of what we are trying to achieve. We’re very hopeful that with Prakash’s encouragement as he goes round the schools, these schools will also give the Education Improvement Project a proper go! 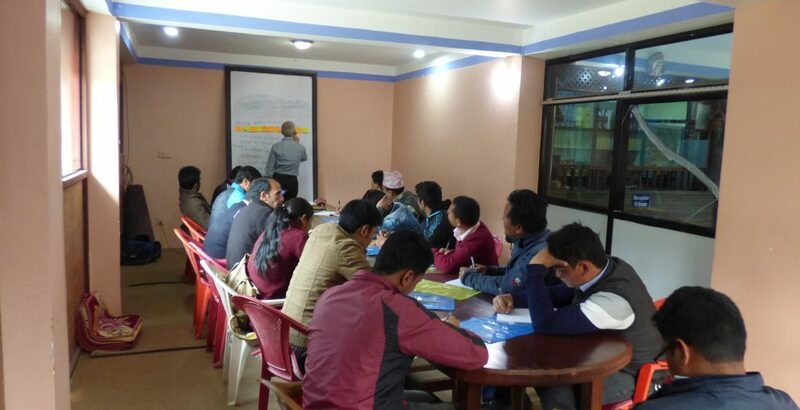 Only one person appeared to have come to the wrong meeting and probably he had in fact come for the other big event of the day – the review by all the schools and HELP of the Himalayan Games held so successfully the week before. He came early so thought he would join our group and was helped along by one of the most enthusiastic heads who translated lots for me in case people had not fully understood! A good beginning but lots more to do before the approach is fully bedded in!